It is imperative that we understand the dynamics that procure, perpetuate, and even proliferate the Structural Gang Culture© philosophy. Those of us who would like to think of ourselves as rational thinkers cannot fathom why a child that comes forth out of the darkness into the light, in pure innocence, would choose to join the Structural Gang Culture©. There are a myriad of psychological and sociological elements that feed the attractive pull of the Structural Gang Culture© and its philosophy. The psychological aspect is addressed by N’STEP®’s Post Traumatic Gang Syndrome© (PTGS) and its various elements, including: Color Addiction©, the Violent Color Response©, and Disassociated Association©. All of these are the results of a violent, traumatic gang experience, causing, in the Structural Gang Culture© member, an aversion, fear and even hatred for colors and individuals that wear the colors that they associate with that violent, traumatic gang experience. This experience procures psychological, neurological and even biological changes in the individual that informs and dictates his/her perception, interactions, and behaviors. The sociological aspects of the Structural Gang Culture are addressed by N’STEP®’s new paradigm and its various elements which include: The Quest for Relevance©, The Traverse©, identification of the Structural Gang Culture© elements, Tributary Transmission©, Street Piety©, Moral Criminality©, Inmate Idolization©, and Institutional Confirmation©. N’STEP®’s Gangology 101© recognizes that Structural Gang Culture© members have been traumatized by violent gang experiences and that that trauma has procured psychological, neurological, and even biological changes that the member is not even aware of. So, although the civilian sees the member’s actions and behaviors as irrational, the changes procured by the violent, traumatic gang experience have made these actions and behaviors normal to the member. N’STEP®’s Gangology 101© takes a holistic approach to healing, recognizing that the Structural Gang Culture© is a subculture and a socially constructed reality, resulting from collective creativity, and therefore subject to transformation. Addressing the psychological and sociological dynamics, N’STEP®’s Gangology 101© introduces both member and non-member to new thought processes such as Recognize, Identify and Transcend© and Managing the Gansta©. It also, through the N’STEP® Normative Structural Gang Culture Change Process©, addresses the four components of cultural change: the psychological, sociological, geographical and demographical components. In its classroom decorum, N’STEP® manufactures a safe environment where a replica of the member’s social order can be constructed. Structural Gang Culture Dyads© are formed, and a process where secondary and tertiary relationships can be created, exercised and nurtured and exist within the primary relationship of rival Structural Gang Cultures©. Bonds are cultivated which ultimately transcend the Conformist Ideology©, allowing rival members to see each other as humans, and not objects of aversion, fear, or hatred. N’STEP®’s Gangology 101© is unique because though there are psychologists, sociologists, and gang researches who’ve studied the Structural Gang Culture©, they cannot juxtapose those studies with experience, leaving them to, at best, attribute clinical terms to violent, traumatic gang experiences which perpetuate and proliferate the Structural Gang Culture©. True to its ideology- that we can no longer leave the gang member out of the process, N’STEP®’s Gangology 101© was authored by one who has been a part of the structural gang culture for 39 years. 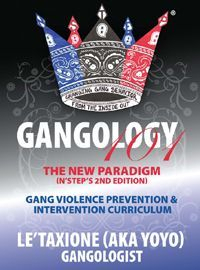 The author, Le’Taxione™ (aka YoYo), takes the vast contributions of the most accredited psychologists and sociologists, and juxtaposes and ultimately matriculates them into the gang experience, creating a gang specific science that speaks directly to the circumstances experienced by our youth. This science proves to be a panacea, efficacious to those who are members of the structural gang culture or not.